Here's your chance to sneak a peek into the adorable home of Tony and Jessica.
" 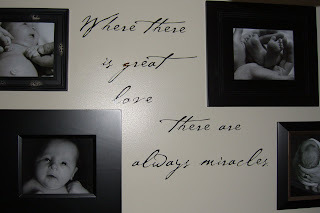 Where there is great love there are always miracles." 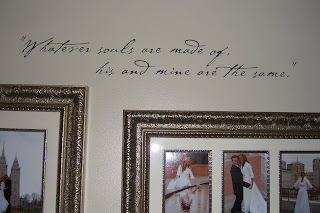 " Always kiss me goodnight"
"Whatever souls are made of, his and mine are the same." 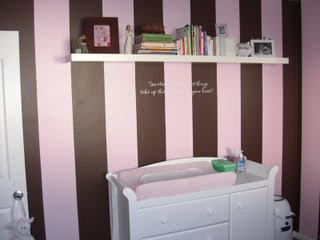 It is hard to see in this pic, but the vinyl above the changing table reads "sometimes the smallest things take up the most room in your heart". Allie, you have the coolest, most creative mind! You'll be so successful! 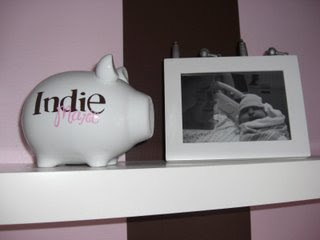 Amberly and I LOVE to see our name on our wall. We'll be ordering some goodies soon. Fabulous graphic impact at a great price! 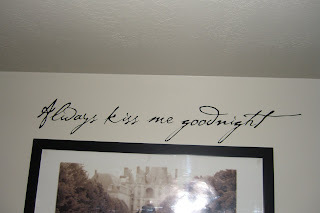 I want to order the always kiss me goodnight phrase...what font is pictured here?